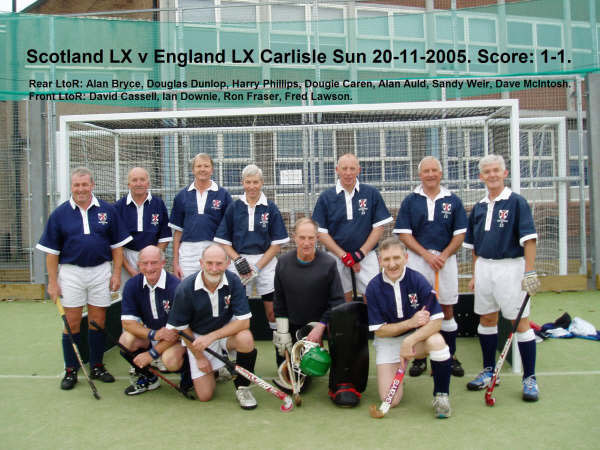 Scottish Veterans LX Hockey Club officially came into existence on 6 March 2005 in Rosyth Civil Service Clubhouse, when the first Annual General Meeting of the club took place. The first item on the agenda was the approval of the Club Constitution, which had been produced by Club Captain Alistair Philip. Doug Morrice, who had acted as Secretary and Treasurer since 2002, stood down and Keith Forster was elected in his place, while President George Black and Club Captain Alistair Philip were re-elected, Alan Auld re-elected as Ordinary Member and Alan Strachan elected as the remaining Ordinary Member. Both Lille and Hellevoetsluis were unable to hold their annual tournaments in 2005, LUC Ronchin having their threadbare pitch relaid and Benno van Krogten, organiser of the Mussel Festival, having been struck down with illness. Both tournaments were to resume but the Hellevoetsluis tournament would henceforth be held every second year. There was a training session before the AGM in which the following players took part: Howard Andrew, Alan Auld, George Black, Alan Bremner, Doug Caren, Ian Downie, Keith Forster, Ron Fraser, Rab Keddie, Dave McIntosh, Peter Monaghan, Harry Phillips, Alan Strachan, Sandy Weir and Jim White. Gerry Toner was umpire. A team from Den Bosch in the Netherlands took on Scottish Thistles in a friendly in Edinburgh as part of their Scottish golf and hockey tour. For the record, the score was 7-1 for Scottish Thistles, Doug Caren scoring three of the goals. Squad: Howard Andrew, George Black, Alan Bremner, Doug Caren, Ernie di Rollo, Ian Downie, Keith Forster, Rab Keddie, Peter Monaghan, Alistair Philip, Harry Phillips, Norrie Springford, Alan Strachan, Jim White. Belgian goalkeeper Johan Herbert invited a Scottish squad to his 75th birthday celebration tournament, and the Scots failed to make the final only on the toss of a coin after drawing 1-1 with a strong England squad, with scorer Ian Downie playing in an unaccustomed role as lone striker. A 3-2 win over the Belgian side in the 3rd/4th place final gave them third place in a memorable tournament. Doug Caren recalls scoring one goal. The highlight for some was the half lobster served at lunch on the Saturday. Squad: Howard Andrew, George Black, Alan Bremner, Douglas Caren, Ernie DiRollo, Ian Downie, Keith Forster, Ron Fraser, Freddie Lawson, Dave Mcintosh, Jim Mitchinson, Alistair Philip, Norrie Springford. Alan Strachan, Sandy Weir, Jim White. Umpire Ken Hunter. On the night before the tournament, there was a busy session in the team hotel in which players were issued with new, white strips and white numbers which they had to iron on to their existing, blue shirts. The hockey got off to a bad start, and or the first time (but not the last), Scotland lost a double figure sum of goals in their opening game against England, replying with two of their own. France proved much less daunting opponents and were easily overcome in the second match. The final group match against the hosts, Netherlands, resulted in a narrow 3-2 win for Scotland to deny Netherlands second place in the group. With no semi finals scheduled, Scotland played off for 3rd/4th place against Germany but the effort put in during the earlier match on the same day told on the Scots, who went down 3-0 to finish fourth. The final was between the two England teams, England beating England LX 3-0 to regain the trophy. Alan Auld, George Black, Alan Bremner, Douglas Caren, Ernie DiRollo, Ian Downie, Keith Forster, Ron Fraser, Rab Keddie, Freddie Lawson, Dave Mcintosh, Keiran McLernan, Peter Monaghan, Doug Morrice, Alistair Philip, Norrie Springford. Alan Strachan, Jim White. Umpire Gerry Toner. Five members (Doug Caren and Keith Forster (Over 60); George Black, Rab Keddie and Jim White (Over 65) travelled to Western Australia with Alliance. Of particular note is that Rab Keddie was awarded the Most Valuable Player (in the world) in the Over 65 category. 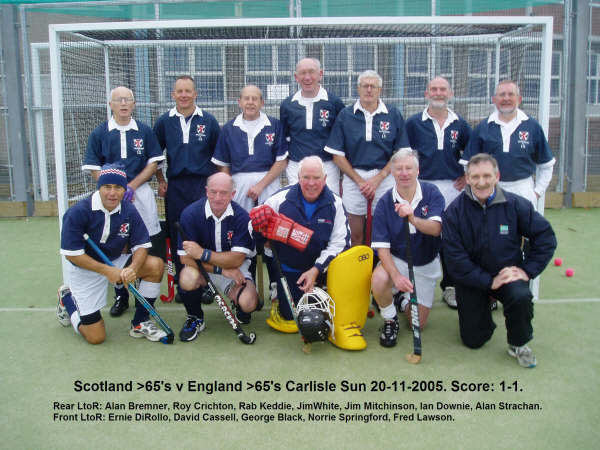 With an increased membership by now, Scotland LX accepted an invitation from England to field both an Over 60 and an Over 65 side in Carlisle in a pair of friendly, semi international fixtures. Numbers were such that several players had to double up, and the sides were of mixed ages rather than being selected on age alone. Both matches ended in 1-1 draws, the Scottish scorer in the Over 60 match being Doug Caren. Over 60: Alan Auld, Doug Caren, David Cassell, Ian Downie, Douglas (Cheesy) Dunlop, Ron Fraser, Freddie Lawson, Dave McIntosh, Harry Phillips, Norrie Springford, Sandy Weir.